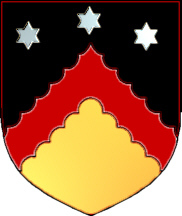 Coat of Arms: A gold shield with a red chevron engrailed; on a black chief, three silver mullets. Spelling variations include: Keeble, Keble, Kebbell, Kebell, Kebill, Kebyll, Kibbel, Kibble, Kibel, Keebler and many more. This surname is first found in Middlesex from very ancient times, perhaps before the Norman Conquest and the arrival of Duke William at Hastings in 1066 A.D. Robert Kebell settled in Maryland in 1736; Jacob, John, and Mathias Kebel all arrived in Philadelphia between 1840 and 1860; Richard Keeble settled in Virginia in 1739. My maiden name is Kibbe, Kibby, Kibbey, Kibbee supposedly from Wales and there is a middle eastern dish called Kibbe. This dish is like bread wrapped around a mixed spiced meat which is inside. I wonder if there could be anything Jewish about this name. The Kibbes went to America in the early 1700's. Just wondering. [The following was written by Bob Kibbee]. 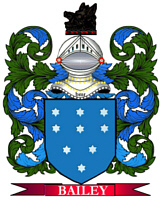 The family seems to have originated in the area around Bridgewater in Somerset, England. There is one notice from the 14th century (Johannis Kebby, smith, 1329) then quite a few more until around 1600 from Somerset (Bridgewater, Broomfield, Goathurst, Charlinch), Devon (Exeter and Plymouth) and Dorset (Lydlinch), according to information from the IGI. One family moved (I'm assuming--possibly a different origin) to London around 1550 and so they begin to show up there, too. A Kebby was a Sarjeant-at-arms under Henry VII and Henry VIII. He took on several assignments of moving naval ships from one port to the other, and provisioning others. There are still Kibbys in Devon to this day (Phonebooks). Supposedly the first North American was Edward Kibbe (name spelled various ways--Keebye on the gravestone) and his wife Mary Partridge. They sailed from Exeter in Devon and arrived in Boston sometime in the 1640s and settled in "Muddy River," now Brookline, MA. He held a moderately prominent position there. Almost all American Kibbee/Kibbe/Kibby/Kibbey/Kibbie families descend from him. There were other contemporary Kibbes, however, for whom it's difficult to account. There was a Henry in Dorchester who might have been Edward's brother, and there are pre-settlement mentions of a Louis Kibbe. There are some serious inconsistencies between the dates on Edward's gravestone and the dates of the Exeter Edward Kibbee. The gravestone says he was 97 years old when he died in 1694, so he would have to be born in 1597. But it's clear the Exeter Edward was born in 1611. Another Edward Kibbe was christened in London in 1594, which is a lot closer. Doreen Potter Hanna suggests that people had a tendency to exaggerate their age, but fourteen years is an odd exaggeration! So I think this needs more research. form for "farmstead, or hamlet." Presumably the first part is a personal name, or in the case of "Kirkby/Kirby" just the word for "church". This is pervasive in Northern England: Whitby, Danby, etc. but a little out of place in Somerset--although migration from the north is certainly possible: there are Kebys in Lincolnshire in the 13th century. The least likely derivation is from "cybby" which was a dialect word for "cudgel, or club." You see this a lot in various handbooks on surnames, but I think its just a mindless attempt to find a likely word or any available word in a medieval English dictionary that matches the sound of "Kibbe" than to find a real explanation, based on geography, known family history, etc. "Cybby" for "cudgel" seems to have been used only sporadically and mostly in Northern England. My theory (perhaps somewhat romantic): There was a 6th century Welsh saint named Gybi (in Latin, Kibbeius) who founded several churches in Wales and the Isle of Man. They all occur in river estuaries, or just upriver from the mouths of the rivers. These have the placenames Llangybi ("Gybi's church" in Welsh)--or some variant. There's a Llangybi on the Usk across the bay from Bridgewater, and I'm imagining someone living near the church or associated with it might have taken the name Gybby or Kybby (I think in medieval Welsh there's no distinction between the "g" and "k"). In fact, there is a Gibby family in that area of Wales--but they could have gotten that name in any number of ways--"Gibby" is a common nickname for "Walter". Not impossible that a family so named could have moved across the bay to Bridgewater in the 12th or 13th century. Another possibility is that there was a Llangybi, or the Cornish equivalent near Bridgewater on the Parret river which was destroyed when the Anglo-Saxons invaded and substituted their church for the original Cornish church. The place name might have survived locally for a while--long enough to give a family associate with it in some way a name. Well, it's fun to speculate. At least one family came from England much later (1900). The emigrant's name was Bon Kibbey. There may have been others. Another family adopted the name in the 1930's. There was a lot of anti-semitism in Hollywood in the 1930's so an up and coming screenwriter named Roland Ginsburg took the name Kibbee, evidently to avoid seeming too Jewish. Ironically, he took it partly because he had a radio show called "The Kibbitzer". I'm not sure if he was influenced by Guy Kibbee, the actor (my grandfather) or even knew him. He had a lot of children and a lot of grandchildren, many still in entertainment, so there are many Kibbees not descended from Edward. Doreen Potter Hanna's Kibbe Genealogical Notes, rev. and enl., Skowhegan, ME: Chedwato Services, 1972, is very much the primary source for researchers and can be borrowed from the NEGHS. George R. Griffiths reworked much of her data with his own for Edward Kibbe, New England Colonist, and Epraim Kibbey, Frontiersman, 1991. This is particularly valuable for descendents in the line Edward, Elisha, Edward, Jacob.